The lack of a business case for the fifth-generation cellular network belies the recent fulsome pronouncements made by operators and chip makers about its potential as a game-changer. Operators, chipset developers, and handset makers are jostling to set new performance benchmarks and to deploy upgraded elements of the 4G standard in advance of a global agreement on the technology, regulation, and market for 5G. Intel is not alone in attempting to define the main industry verticals that operators will want to monetize. Missing from the list is media and entertainment (M&E), something that mobile operator EE—owned by U.K. telco BT—is keen to put front and center of the global agenda. 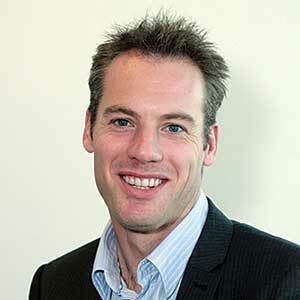 “We are pushing the industry in the direction of M&E as a vertical alongside automotive, broadband, manufacturing, and e-health,” says Matt Stagg, who is responsible for video and content technologies at EE. 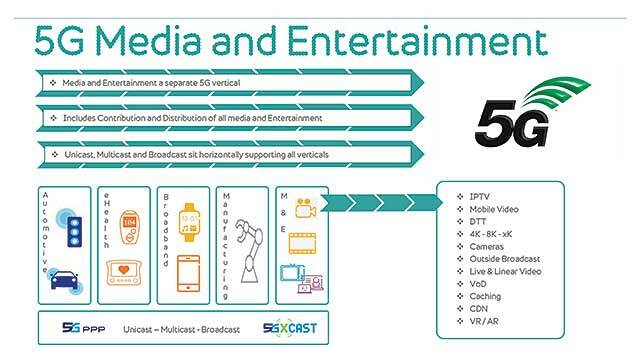 That ranges from IPTV and 4K/8K video to outside broadcast cameras, live as well as linear video, video on demand (VOD) and caching, the CDN and virtual/augmented reality. While 8K will be inclusive of the ultimate 5G specification, Stagg is dismissive of any near-term broadcast applications using the network. “Even 4K is limited because content is limited,” he says. Far more important from a monetization point of view is the ability to offer more video particularly around live events. He points out that only around 10 percent of all video captured at a live event (such as a football match) is actually distributed. The transition to IP and remote production architectures combined with distribution over 5G will permit far more of the in-game assets—such as streams from player cams—to be monetized. EE argues that the technology should be disconnected from the application and that unicast, multicast, and broadcast should underpin all verticals. This work is already in progress as operators worldwide look to deploy and promote upgraded versions of 4G, elements of which will evolve into the 5G network. “Network operators see Gigabit LTE as an opportunity to extend the return on their investments in 4G networks,” says CCS Insight’s Ben Wood. The analyst says video will represent the main monetization opportunity for telcos in serving more data over a ramped-up 4G. “Given consumers’ insatiable appetite for connectivity on the go, expect telcos to sway consumers to sign up to bigger bundles,” suggests CCS Insight’s vice president, multiplay and media, Paolo Pescatore. The way in which we use devices and interact with our surroundings will shift, just as it has previously with 3G and 4G. According to Futuresource Consulting, the targeted download rate is 20Gbps and the upload rate is 10Gbps. This means we will have fibre-like performance available on-the-go. On the radio side, the 4G upgrades includes using massive multiple-input, multiple-output (MIMO) antennas, a way of combining multiple antennas into devices to increase the throughput dramatically without moving to 5G. Operators are also looking at carrier aggregation, another feature which can be implemented before the 5G standard is ratified. This combines multiple spectrum bands into a single device with more throughput and capacity. Sixty-eight 4.5G networks were commercially deployed worldwide in 2016, and the number of networks deployed this year is expected to reach 120, according to Chinese handset brand Huawei. 5G promises to revolutionise not just video but the entire ecosystem of connected devices. Nokia, for one, has released a massive MIMO adaptive antenna as part of its 4.5G upgrade; it can boost speeds up to 1Gbps, which is the nominal 5G target. The antenna uses 3D beam-forming, where mobile signals are targeted directly to devices, rather than broadcast in all directions. 3D beamforming will form part of the 5G spec. Early commercial rollout for 5G is expected mid-2020, the rough date that ITU Radiocommunication (ITU-R) is expected to ratify a standard. As part of that process, the 3GPP (a collaboration between telco associations to make a globally applicable standard) is working toward standardization of a new access technology named 5G New Radio (NR). The first phase of 5G NR specifications—3GPP Release 15—is expected to be completed next year. The second part—Phase 2 Release 16—is expected to be completed in late 2019, allowing for commercial deployment from 2022 onwards.